These fine pretzels are covered with caramel, yogurt and milk chocolate . Only serious pretzel maniacs need to apply. A wheel, full of delightful goodies for the lucky person who receives it. 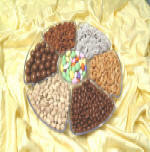 You will make a big impression with this mouth watering tray. Roasted almonds, choc. espresso beans, roasted/salted cashews choc. malt balls, roasted/salted pistachios, choc. non-pareils and choc. Jordan almonds. Roasted/salted pistachios, roasted/salted cashews, choc. non-pareils, milk choc. almonds, choc. chip mini cookies and Jordan almonds. Roasted/salted cashews, roasted/salted pistachios, milk choc. raisins, milk choc. Roasted/salted pistachios, roasted/salted cashews, roasted almonds, assorted Jordan almonds. Perfect snack tray for a party or before dinner. It has: Roasted/salted celebrity mix honey-roasted pecans and Medjul dates. The best sun dried fruit from sunny California; figs, peaches, dates, apricots and more. We only select rich, sweet fruit that bursts into your mouth. It has all the right flavors and colors to have fun.